This entry was posted on Friday, April 15th, 2011 at 3:02 pm	and is filed under Coding, PID. You can follow any responses to this entry through the RSS 2.0 feed. You can leave a response, or trackback from your own site. > This number gets fed into the pid equation, which results in an undesirable spike in the output. Obviously, this is true for some (most?) applications but it is not universally true. I worked on a controller for an electric heater that required a rather “aggressive” derivative. Dramatic changes in the output were not only acceptable, they were required. I’ve seen two methods for getting roughly the same effect: 1. Output rate of change clamping; 2. Output filtering. The advantage is the user can eliminate all spikes, allow some “spikiness”, or allow all spikes. That’s a fair point. It explains why all manufacturers allow you to choose “derivative on error” even if they default to “derivative on measurement.” I overstated when I said that looking at measurement is the right way to do things. I’ve seen those output massagers as well. They’re a little out of the scope of this series, but highly effective in the right hands. They’ve been added to the “things I’ll try to talk about later” list. Im working on a line follower……..
Can u help me with dat……….How to define a setpoint if im using Digital Sensors(Five).Is it that the setpoint will always be that the middle sensor should be on the line. And then how do i calculate the error and use it for my motors…. You would need to convert the 5 digital signals into 1 analog signal (-2 < -> 2) I’m not sure if this would give you enough resolution to use a pid effectively, but that is how you would do it. how much is ur blog applicable for a line follower robot (with 5 digital sensors) as it is? i mean wat changes we may hv to do ? apart from our own algorithm language n al? 1) is SetTunings method required for us?i mean til now we thot kp,ki,kd are constants and we ll give them values?n they shouldnt change their values in between right? 2)how exactly to call compute method after certain time (say 1ms) from main ? u hvnt specified it on how to call it from main? n is millis() method used for it? 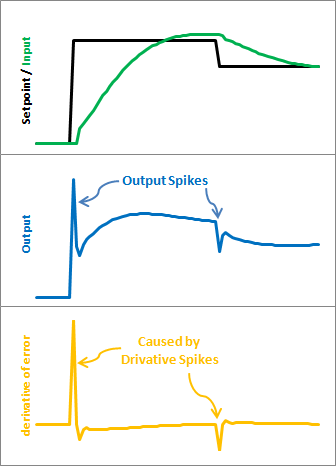 3)how we relate output/correction with speed of motors (2)? we know that we ll hv to use PWM. we know how to do it. but we want ur word on this. Another thing to consider is that the reference can be changed at a controlled rate. There is no advatantage of instantly changing the set point if the controller can’t keep up. It will tend to go “open loop”. You can gradually change the setpoint within the PID loop. 'aLittleMore' and 'someDivisor' could be any number depending on the wanted rate of change. Of course 2, 4, 8, ect would be a simple shift for 'someDivisor. 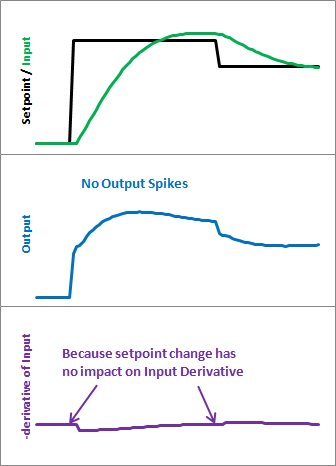 @bjbsquared while the setpoint ramping you describe makes things more forgiving for difficult processes or less-than-perfect tuning parameters, I think it’s overstating a bit to say that there is “no advantage” to instantly changing the setpoint. For many processes and with a properly tuned controller, you can achieve a new setpoint far more quickly by just stepping the setpoint to the new value. I’ve found that if the PID is running at a high rate (200 hz) and a sensor that measures the rate of change is running at a lower rate (say 10hz) you’ll end up with spikes if your D term is high. We have to run a moving average filter over the derivative to keep that under control or else you’ll have a quad copter engine that sounds terrible or other more negative effects. @Jason First of all thanks for even being here. I’m a huge fan of the diydrones project. now on to pid. In my experience (which is almost entirely large, industrial PID,) you don’t gain anything by running the PID more quickly than the input signal changes. you’re asking it to compute a new output without any new information. and yes, you get weird derivative spikes. since the PID is evaluated 20 times for every input change, and the derivative is looking at this point compared to the last… you get 19 0’s then a blip. I rarely use filter in my professional life. generally I find that I’m better off removing D than trying to massage the signal to make it work. This requires things to be tuned fairly well however, and it takes some time to get a knack for that. but as I said, I have very little robotics / motor control pid experience, so there may be advantages I’m unaware of. have you tried running your PID more slowly?